Every year since 2012, we’ve spent some time after the season looking back at those that wore the Birds on the Bat. Whether it’s a bit player that got into just a couple of games or someone that played almost every day, we’ll look at their stats, their positives, their negatives, and grade them based on what we would have expected from them. The stat line is from their time in St. Louis, though splits and other numbers may include time with other teams, if applicable. Think of this as like the players packing up their locker and then seeing Mike Shildt before they head off for the winter. Once again, our great header work comes to us from cardinalsgifs, who continues to be a master. Positives: Returned from the disabled list and proved that he wasn’t completely cooked, posting six scoreless innings against the Dodgers to avoid a four-game sweep by the eventual NL West champs….struck out over a batter an inning and had a 25/4 K/BB rate when he returned in September….only one person attempted to steal a base on him all season and they were caught….had a .673 OPS against in the second half….had a 3.45 ERA in April….had a 0.00 ERA in his two wins….batters hitting first in the lineup had a .610 OPS against him….cleanup hitters went 1 for 20….had a .189/.204/.302 line against when ahead in the count….the first batter he faced each time had a .393 OPS….had a .196 BAA when there were two outs in an inning….batters hit .188 when there were two outs and runners in scoring position….hitters had a .571 OPS between pitches 51 and 75….on five days’ rest had a 3.38 ERA….had a 3.20 ERA in night games….four of the home runs he allowed were solo shots. Negatives: Looked done after a May game in San Diego, where he walked six in 2.1 innings while Mike Matheny had the slow hook….walked 14 (and struck out just 15) in 18 innings from the beginning of the season through that game….had a 1.47 K/BB ratio against left-handers….had a 4.84 ERA after he returned from the disabled list, though a little of that is inherited runners scoring….gave up a .909 OPS when receiving six or more runs of support….second-place hitters posted a 1.228 OPS against him….batters hit .563 with a home run on the first pitch….they had an .829 OPS if they were ahead in the count….two of his five homers came with two outs….allowed a .390/.397/.610 line with one out in an inning….batters hit .409 in high leverage situations….allowed a .946 OPS between pitches 26 and 50. 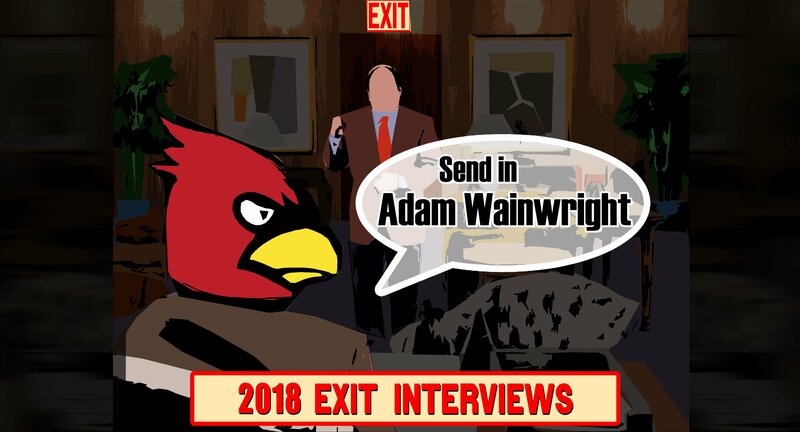 Overview: It’s been a long time since Adam Wainwright has been Adam Wainwright. That’s not surprising given how much wear is on that arm plus all the injuries plus the natural progression of getting older. There was at least some optimism when he returned from his DL stint in September as we saw a better Waino than we’ve seen in quite a while. Wainwright says he feels healthier than he has in years, but we’ve come to take Uncle Charlie’s reports about his health with some grains of salt. Still, when you are afraid the last memory of Wainwright is going to be trudging off of the San Diego mound after such a terrible outing, seeing him in September was much better. You still hold your breath some, but there could be a reasonable expectation of a good game, not one that required rose-colored glasses. Outlook: With Wainwright exhibiting some bounce back, it’s not surprising that the first order of business this offseason was signing him to a one-year deal. It’s a very creative deal, with a low base salary ($2 million) and incentives for both starts, finishes, and other games. If Wainwright pitches well, as we hope he can, he’ll still make less than he did this year. It’s very good to see the club tie the financial outlay to his health and effectiveness while not pigeonholing him in a way that might crimp what Mike Shildt needs or wants to do. It’s also great to know that we have another year with the Cardinal legend and I look forward to him hopefully putting some of the bad taste of the last few years to rest.